One of the best things introduced for developers in SharePoint 2010 was the SPMonitoredScope, which can be used to trace your application, and to pin down potential bottlenecks. 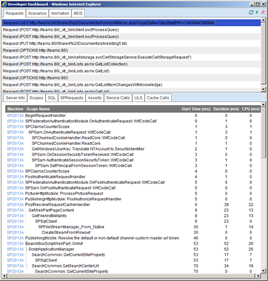 I wrote a post on how to use it way back in 2009 – Improve you SharePoint 2010 applications with monitoring using SPMonitoredScope. It’s still worth a read and still true for SharePoint 2013. But the SharePoint team has continued to evolve the SPMonitoredScope in SharePoint 2013, with two small but interesting changes. 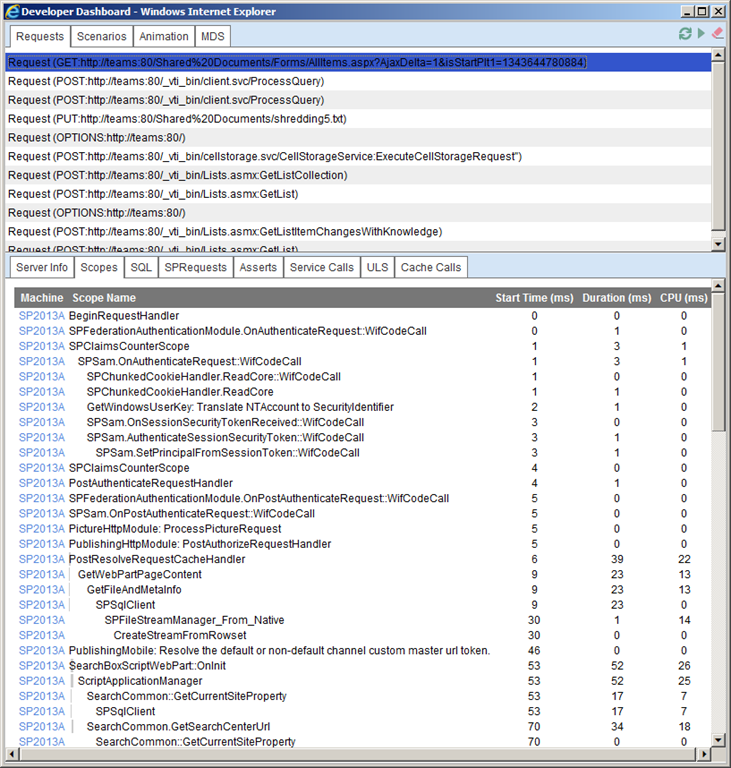 The SPMonitoredScope in SharePoint 2013 has a new constructor which allows you to specify a TraceSeverity for the scope. Why this TraceSeverity then? 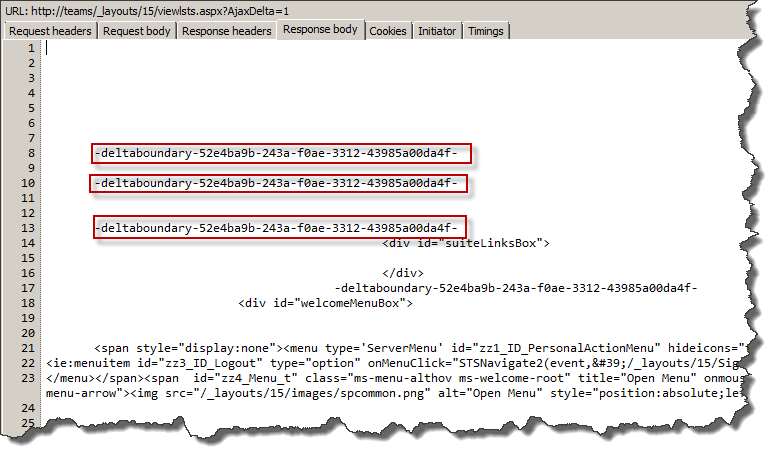 By default when entering and exiting a monitored scope this is logged in the ULS logs with the ULS log trace severity Verbose (always used by custom usage in SharePoint 2010). By now specifying a trace severity scope we can control at what level of diagnostics logging this should be visible in the trace logs. You can find the logging level for this in Central Administration > Monitoring > Configure diagnostic logging and then under SharePoint Foundation > Monitoring. This is a great new feature and it allows us to have better control of what goes into the ULS Trace logs, and potentially allows us to avoid flooding of unnecessary messages, when there is no need to trace. A completely new feature to the SPMonitoredScope is the possibility to detect if the Developer Dashboard is running – that is, if the Developer Dashboard window is open, not if it’s turned on or off in the farm. You check this status by using the IsDeveloperDashboardEnabled property of an SPMonitoredScope instance. Here’s a simple Web Part that uses the new constructor as well as displays if the developer dashboard window is open or not. This was just two small but (at least for me) important improvement for developers in SharePoint 2013. SharePoint 2013: Developer Dashboard shows no data "issue"
I hope you all had the pleasure to try out the new and improved Developer Dashboard in SharePoint 2013 Preview. It's a fantastic improvement to its predecessor and contains a huge number of improvements. One of the most notable ones is that it's no longer a control on your page which only shows you information about the current request. It's now a separate window which shows you all requests since you started the developer dashboard session. It can actually compete somewhat with ULSViewer! Turning on the Developer Dashboard is done exactly as before in SharePoint 2010. You use PowerShell for that. The only difference is that the developer dashboard now only have two modes; On or Off. The old OnDemand mode is deprecated and if you set it to OnDemand it will act as On. My Developer Dashboard does not show anything!!! So, now you have turned on the Developer Dashboard and you would like to check out how cool it really is. You click on the developer dashboard icon in the upper right and the new dev dashboard window opens. If you're a real IT-Pro (or any kind of SharePoint professional for that matter) you have not used the Farm Configuration Wizard and configured all your services "automagically". Instead you have created your services manually or by scripting them. Also to save some RAM memory you have not fired up the (new) Search Service, to avoid those pesky noderunners (can't help thinking about Lode Runner when I see em). If this is the case you will likely not see any data logged in the Developer Dashboard, instead you'll find these entries in your ULS Trace log: "WCF Request GET failed with error Store hasn't been provisioned". A similar error is also shown in Fiddler. Fortunately the fix is really easy! It all comes down to how the Developer Dashboard now is implemented. Previously it was a "simple" control on your page showing the current request only. The new 2013 Developer Dashboard depends on the Usage and Health Data Collection Service Application. This is a Service Application that you need to create through PowerShell and it's a simple one-liner. New-SPUsageApplication -Name "Usage Application" -DatabaseName "SP2013A_Logging"
Just modify the line above with the name that you would like to have for the service application and enter a database name as you prefer (if you leave out the -DatabaseName parameter a database called WSS_Logging will be created). Once this is done, the Service Application should start logging to the database and the Developer Dashboard should start showing some neat logging data. Well, by know everybody living in the SharePoint world are sitting with their best tin foil hats on and installing, configuring and fiddling with SharePoint 2013 Preview, which was announced today by mister Steve. I've been fortunate to be a part of the (debated) closed beta for some time and have been trying out the new version of our favorite product. You probably will be overwhelmed with blog posts over the next couple of months, up until the SharePoint Conference 2012, and continuing after that. And I aim to be a part of the flooding (at least partly)...starting with a topic that I think is profoundly important - Authentication. Note: this is written for SharePoint 2013 Preview. In SharePoint 2010 we had to choose between two options when creating a Content Web Application - to use Classic mode Authentication or Claims-based Authentication. Classic mode used the same model as SharePoint 2007 and previous versions used and Claims-based authentication was all new and shiny. Initially the recommendation was to use Claims-based content applications, but after a while we discovered the limitations of Claims-based authentication in 2010, so we went back to using Classic for most implementations. Examples of limitations was PowerPivot, Reporting Services etc. There was/is also quite a few limitations with SAML claims. Now in SharePoint 2013, Claims-based authentication mode is the default authentication method. You cannot from the web interface create content web applications using Classic mode. If you need to create a Classic web application you need use PowerShell - but you should not do that (unless you have some specific requirement) since Classic mode is now considered deprecated, and will likely be removed in future releases of SharePoint. In SharePoint 2013 it is also required to use Claims-based authentication mode since there are lots of features that relies on it, such as app authentication and the new server-to-server (S2S) authentication. So from now on always use Claims-based authentication in SharePoint 2013 and SharePoint 2010. How do I convert/upgrade my Web Applications? So if you have a Web Application in Classic mode (2010) today, how do I update it to a Claims-based Web Application for 2013. This change is a big change! You might have customizations in your farm that are not Claims compatible. For instance, they might not understand the claims encoding format. The best recommendation I have now is to upgrade your web applications to Claims, before upgrading to 2013. Yes, that's true. If you do the two upgrades at once and you run into trouble, the likelihood of finding the issue is lower and will consume more time. The second best option is to create a Classic Web Application in 2013 and attach (and upgrade) your Classic content databases to that web application and then (after testing) utilize the new Convert-SPWebApplication cmdlet to convert it. (Note: ye olde MigrateUsers method is deprecated in 2013, thank godness!). More details can be found in the TechNet article "What's new in authentication for SharePoint 2013 Preview". Also make sure you do learn WIF, WS-Trust, SAML and what an STS is. Here is a good starter guide. Did I mention test? And have fun! I do! 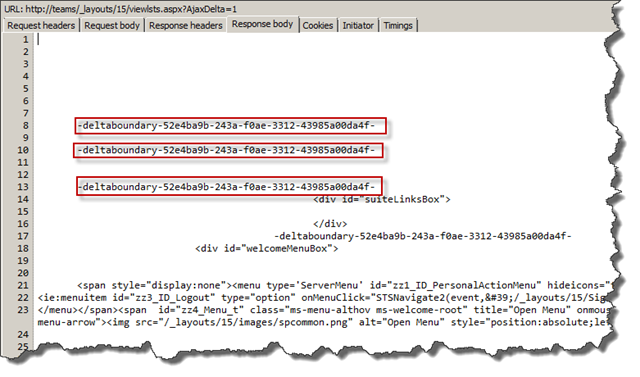 Once you start adding providers and Claim Types to SharePoint 2010 using you might start using Claim Types that are not pre-defined by SharePoint. In this case SharePoint automagically assigns the encoded Claim Type a unicode character starting with the 0x01F5 (500 or ǵ) and then incrementing that value with 1 for each and every Claim Type. (Note that it's not just incremental, it can't be uppercase characters or whitespaces.) This is really important to know since if you ever going to move information from one farm to another then you need to configure them in exactly the same order, otherwise your Claim Types encodings, or SharePoint for that matter, won't work. Until the June 2012 Cumulative Update there was no (good) way to find out what the encodings were that you've added and there was no way to specify the encoding for a Claim Type. But from now on we have two sleek cmdlets; the Get-SPClaimTypeEncoding and the New-SPClaimTypeEncoding. New-SPClaimTypeEncoding -EncodingCharacter ([Convert]::ToChar(517)) -ClaimType "urn:another-claim-type"
After answering Yes two times you'll now have the Claim Type encoding in your farm, and once you use it for a mapping it will not generate a new encoding. Note; if you get an ArgumentException it can be one of many reasons. Make sure that your character is not used in another encoding, it is above 500 (0x01F5) and not an uppercase or whitespace character. That was it, two small but quite powerful and really useful cmdlets. Whenever you need to script environments and are doing Claim Type mappings, make sure that you utilize what you got in the toolbox!